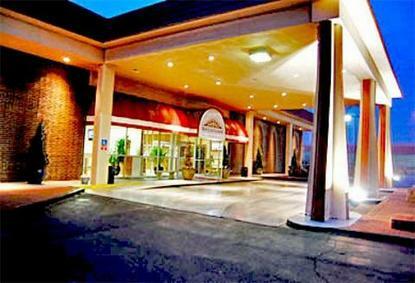 The Bricktown Hotel and Convention Center is located in the heart of Oklahoma City, just 1.5 mi. from the OKC Ford Center and Cox Convention Center. We are on Reno Avenue, across the street from the future American Indian Cultural Museum, nearby attractions include the AT Ballpark, Alfred P. Murrah (federal building) Memorial, Remington Park / Casino, OKC Zoo, as well as countless cultural, and historical museums. We provide 24/7 shuttle transportation (to/from all Downtown and Bricktown locations and airport)free shuttle going downtown, complimentary high-speed wireless Internet throughout Hotel, complimentary use of business center, and access to 65,000 sqft Oklahoma University Fitness Center including indoor Olympic size Pool. Our breakfast is included free of charge with fresh made to order Belgian waffles. You can relax in the evenings at our Tusk Lounge, which has HD Plasma Programming available for your entertainment.Our spacious property has 188 guestrooms, including executive suites. Accommodations include digital cable television with HBO, WIFI, stainless steel fridges & microwaves and personal voicemail. Our premium RUSK Sensory and Spa Products will complete your experience.